Sensational experience! Breathtaking scenery and beautiful wild animal viewings! We did a little research on the internet and found Walk 91 to be the best provider to suit our needs, as it offered shorter walks of 5 days, and that was exactly what we were looking for! The itinerary was perfectly planned, adjusted to our needs and wishes. We were provided with a very accurate map, where you could easily follow your way on the GOW. We were also provided with a descriptive and detailed itinerary on how the walk would be, with a track grading (easy-medium-hard), so we were always well prepared to what was to be expected. The trail was very well signed, too, and the meeting spots where we were to be picked up were well described in the itinerary. We have to admit- everything was perfect! We felt very safe due to the good description, the provided mobile phone and the epirb. And the lunch packet was great!!! The team of Walk 91 was very attentive and obliging. All the accommodations were wonderful and we felt we could really relax when we arrived there. Everything was perfectly organised and the hosts were really kind and welcoming. The walk was amazing!The scenery and landscape were amazing and we were able to see kangaroos, wallabies, koalas and many beautiful birds. It was incredible! Every day was fulfilling and satisfactory. The trail was well signed and the Parks Victoria grading for each day was pretty accurate. There is only one section of the walk, that we think Parks Victoria could improve and that is the last part of the trail “Castle Cove to Milanesia Gate”, which is on the main car road, so that there are some cars passing by. 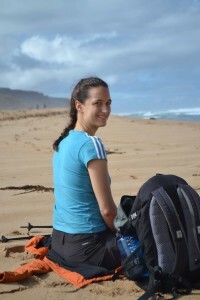 Our tips are… Bring some good shoes, water bottles and a camera and enjoy the Great Ocean Walk! It´s totally worth it! This walk is sensational and exceeded our expectations. We loved the diversity of scenery and environment. The 3 brochures that Mark gave us (Flora, Wildlife and Fungi) were really great and we referred to them a lot when we saw things along the way. 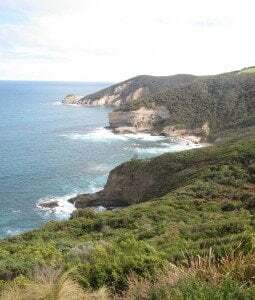 We really loved the eucalypt, beech and manna gum forest walks, the coastal heathlands and the stretches of beach we walked along. The track was really well maintained and signposted and the toilet facilities at the GOW campsites were excellent. I had done quite a bit of reading about the walk beforehand so was well prepared for the distances and the terrain. We absolutely loved all our accommodation… The meal drop service was excellent and the food really high quality. The transfers to and from our accommodation each morning and night, worked really well (nice drivers). 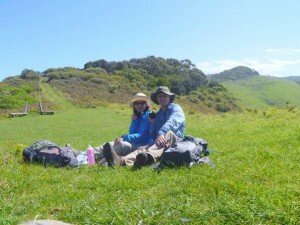 It would have been good to have been given the Walk91 Blog beforehand – i really didn’t discover this until afterwards and some of the comments from other walkers I found very helpful. The walk was energetic, challenging and a lot of fun. We are so glad we did it, and highly impressed with Walk 91. 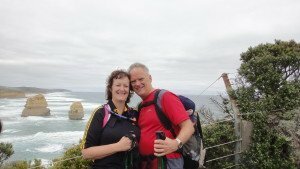 I wanted to formally say Thank you to you and Mark for the fabulous time we had with your company, Walk 91, over the March long weekend just gone, on the Great Ocean Walk. The preparation work was thorough and professional, and thoughtful in that you suggested the bigger house with two bathrooms which was excellent. Also, the catered option was a resounding success. Good hearty food in plentiful supply. And Alison was very grateful to you for the offer of the loan of your hiking boots. She ended up buying some runners from High on Heels! We also wanted to acknowledge the outstanding work done by Reuben during our tour. He was unfailingly helpful, punctual, understanding, funny and professional. He won the hearts of the seven 60-year old ( some of us are still 59 3/4) women! 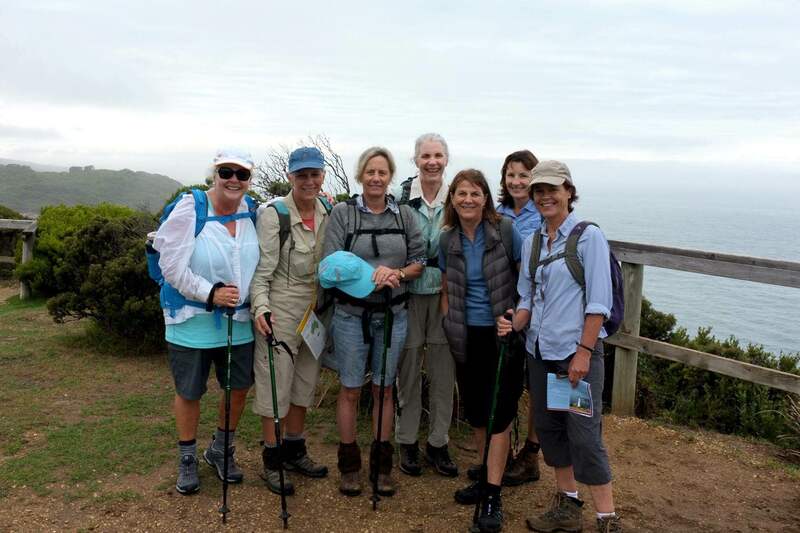 Thanks Sally, it was great to have you here and we are so happy that you enjoyed your Great Ocean Walk with us! Thanks once again for organising yet another excellent walking experience. Everyone in the group had a great time and as usual the accommodation was second to none. I hope to come back and do it all again some time in the future.Thought you might like a photo from the Eco Centre. As a more mature group 65-70+ we were delighted to have the walk crafted around our needs. Those who did not wish to walk for the entire day had options of places to come out included in the itinerary. The walk was SPECTACULAR. Stunning vistas and varying vegetation, flora and fauna. 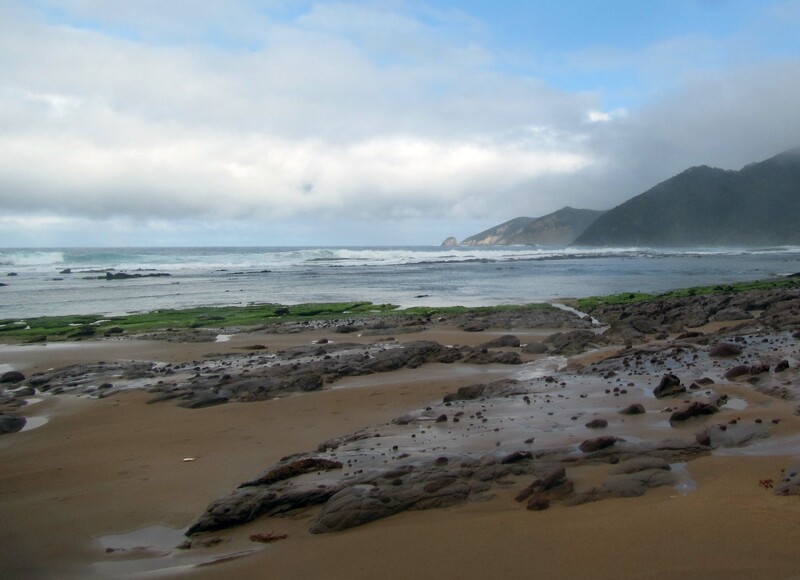 Glorious wild beaches with ever changing colour of the surf the rocky plateau and towering headlands. Some parts pretty challenging walking, especially walking between Melanesia Gate and Moonlight Head. We were able to keep to the recommended times. Maps and brochures colourful and informative. (Perhaps more indication of distances between vantage points and suggested stops for lunch). Due to inaccessibility of much of the walk. Emergency assistance advice signs and possibly emergency assistance stations along the track would be advantageous. Our tips as requested for future walkers? Practice hiking up and down staircases. Make sure your day pack fits well on your hips. Wear in your hiking boots before embarking. Carry at least 1.5 litres of water. Electrolytes in pack also helpful for dehydration. With life’s craziness back in full swing, I cherish my memories of that feeling of tranquility. Certainly the only catered walk I found for the dates I had available on the Great Ocean Walk, and probably the only catered walk with ANY start date, variable lengths/sections. Fantastic introduction to long walks. Immaculate rooms, hot showers and hearty meals . . . what else is required after 20km? Scenery ranged from spectacular to picturesque, terrain from rugged to light, and track clearly signed in the vast majority. Personalised transport each morning and afternoon, all I had to do was walk! This was my first “walk” – a personal test before I set out to sate my curiosity of the ‘el Camino’. And I hiked alone. After lunch on Day 1 I began to treasure the solitude. Never doubted my ‘safety’, with a borrowed phone and ‘reception’ points clearly marked on my map, and an EPIRB for that final insurance. We have had many single walkers (particularly ladies) enjoying the Great Ocean Walk track. You more than likely see other walkers on the track and often our walkers will just team up with walkers they like alone the way. However if this does not happen we have great hosts at our chosen accommodation if you like a little company at the end of the day. The accommodation providers added greatly to our enjoyment of the walk and I couldn't recommend them or their accommodation highly enough... we had superb food and slept well each night. 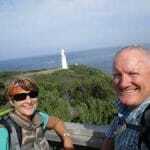 I looked up Great Ocean Walk on the net and saw your website and liked the fact that you were a local business organising walks for self guided walkers. Some of the distances allocated for each day were too long for us but probably not for all your walkers. However Walk 91 were extremely accommodating and picked us up or dropped us off in locations so we didn’t need to walk the entire distances. The accommodation providers added greatly to our enjoyment of the walk and I couldn’t recommend them or their accommodation highly enough. Both were clean and comfortable and we had superb food and slept well each night. We found Shayne’s talk as he showed us around the eco lodge property at Cape Otway very interesting. We enjoyed seeing the spotted quoll and potoroo and holding a sugar glider. Susie’s cooking and hospitality was exceptional and I have never tasted such a delicious lemon tart as hers. The lunches provided by all the hosts were excellent. It was easy to find the meeting spots each day. We found the walking itself easy and the track mostly good. We didn’t find the hilly parts too steep. The scenery was varied and interesting. 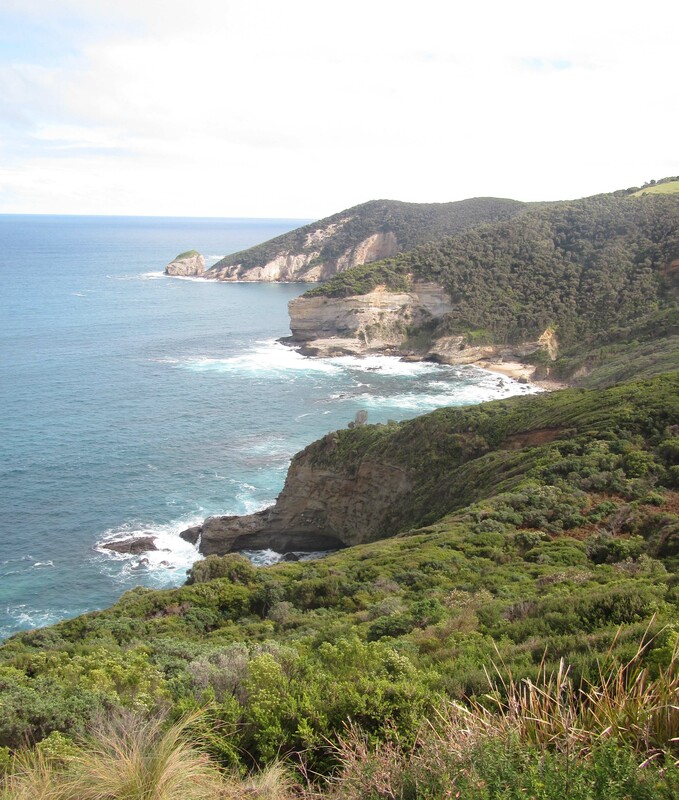 We enjoyed the looking at the spectacular coast line and noticing the changing types of bush as we walked. As it was spring the wild flowers were out. There was a lot of wildlife. We stopped on the track and watched the birds, saw a couple of koalas, an echidna and lots of wallabies. Coming from NSW we had never seen and heard koalas in the wild so we were thrilled to see and hear them. We were very happy with our walk and Walk 91 couldn’t have organised it better or been more helpful to us. We’d like to give a special thank you to Sam for his great driving! We had a great time on our walk and you and Mark (with the help of everyone at all the accommodations) made this one of the best holidays we have had. The accommodation was wonderful, and the hosts were gracious. 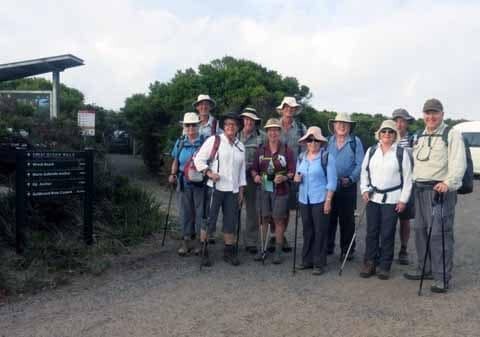 Our tips for other walkers would be to… Train, particularly in walking distances, and different terrains, especially if they have not done this kind of walking before. It irons out the problems with boots, blisters and carrying packs, without the training we did before hand I think I would have been a lot more worse for wear, and had not enjoyed it. Hello Mark, just letting you know we are both home safe and sound, back to work tomorrow after a wonderful holiday. We once again would like to thank you for your wonderful care, we loved the walk and would happily do it again. I read about the Great Ocean Walk first in the Sunday paper a while ago, but when we decided to do a walk I simply googled Great Ocean Road Walk and found your Walk91 site. (However, if I was to be critical, there are not quite enough signs, and the weeds need to be controlled. Perhaps a few more seats would be good too.) – see walk 91 comments below…. I was comfortable in that it wasn’t over managed, but I could imagine that some people would want to be told or shown exactly what and when and how, e.g. where to stop for lunch, when to stop for a rest etc. Our tips would be…. Prepare for the hills and do plenty of practice walks – not just around the block!! 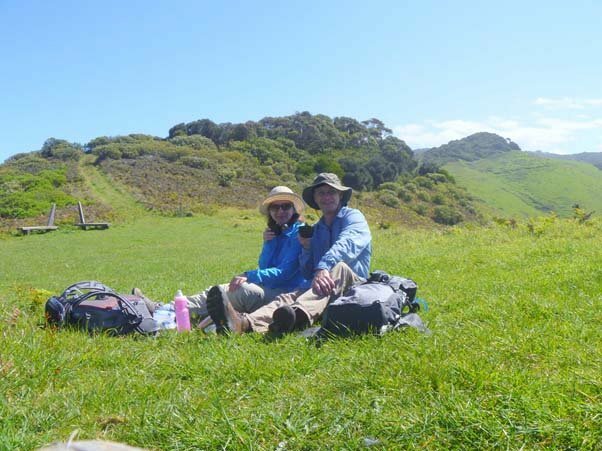 We are very happy you enjoyed your Great Ocean Walk…and it was fantastic to see some of the wonderful pictures you sent us. We will add them to our library!